Back in 2007, I made a special devotion to St. Therese of Lisieux. I asked her to ask Jesus a special intention and He answered me. Since then I always run to her when there’s extra special request. For me she’s like a spiritual sister I never had. Someone who share the same love for Jesus as I am. And I know she always confided to Jesus on my behalf. I really wish if God permits I enter Heaven I want to spend my eternity doing good on earth with St. Therese. 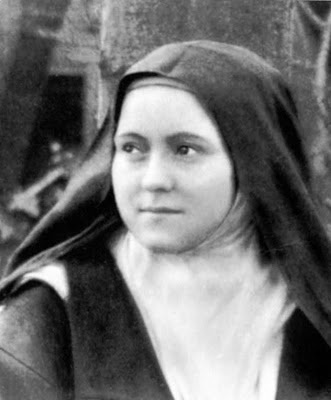 I was 19 when I first came across St. Therese. I remember writing in my journal I wanted to achieve something big by the age 24. St. Therese died at the tender age of 24 and during her short period of time living here on earth, she has touched so many hearts and souls. So I made promise 6 years ago I would do the same. Next week, I’ll be turning 25. I’ll be living a year longer than one of my favourite saints.What have I done so far? Have I did enough? These questions clouded my mind as I approach my birthday. All I know for now, my work here on earth has just started. I still have long way to go. The Story of a Soul is St. Therese’s autobiography. I’ve read half way through and sentence after sentence touched me. I knew years ago that I relate so much with St. Therese but reading her autobiography affirms everything. Here I am sharing quotes from the book that I could identify with or touched by. So doesn’t matter how deep is our faith or simple our souls are, manifestation of God’s love are the same in all. Weeks ago, sanctity became our topic of conversation when the Wallbangers and I gathered again in Kuching. Each of us possessed the desire to be holy and canonized yet we know we are far from achieving it. This quote is a personal reminder for me that if I truly want to become a saint, I must be selfless. Again, a reminder for me. I discerned a lot this year about my true calling. I am willing to go far to prove how much I love Him. How much I am willing to leave everything for Him. Yet, in the same time I knew He has different plan for me. I am willing to submit to His plan. I am free to make any sacrifice that I choose. But I choose to make a sacrifice that I know He wanted me to make. And this sacrifice is harder than I expected. To stay and serve the outside world. I know that it would be a luxury for my soul if I choose to stay nearer to His home. I’m trying my best to be selfless. I used to think to sacrifice worldly things and serve Him fully in religious life was hard. Now personally for me, to stay in this worldly world, secretly watching out for people that need prayers and pray for them, to feel the pains and sadness first hand, in the same time fighting spiritual warfare and worldly temptations, this is suffering and hardship. I am willing to do this for Him.